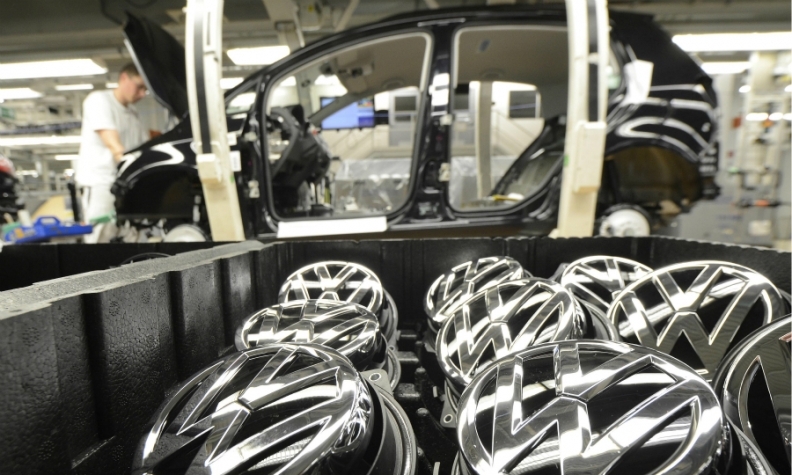 A Golf moves along the assembly line at the Wolfsburg plant. BERLIN -- Volkswagen Group said production at its factory in Wolfsburg, Germany, had been curtailed in some areas because of a parts shortage caused by a supplier refusing to keep to delivery commitments. "A supplier has suspended the contractually agreed delivery of components," VW said in a statement on Wednesday. "This is creating a bottleneck in production." Wolfsburg is VW's largest factory. It builds the Golf hatchback, Tiguan SUV and Touran minivan. VW declined to specify the impact of disruptions on output and staff. The plant employs about 60,000 people and builds as many as 3,800 cars per day during peak times. To contain the costs of the production losses, VW said it is pondering flexible working hours in some parts of the factory. Material supplies at the plant will only last this week, so upholding production next week is no longer guaranteed, Bild newspaper reported today, citing an internal memo to senior managers. VW said the regional court in Brunswick, near Wolfsburg, last week issued an injunction that forces the supplier to resume deliveries but the company has not yet complied with the ruling. A shortage of gearbox parts is also affecting production another VW German factory in Kassel where over 16,000 workers produce gearboxes, parts and electric motors, a VW spokesman said, adding the company is looking at flexible hours at that factory too. The disruptions coincide with similar problems in Emden, VW's northern German plant where a sister company of the supplier stopped deliveries of seat covers earlier this month, two sources close to VW said. VW on Monday said it will reduce working hours for about a third of the Emden plant's 9,000 staff, initially from Aug. 18 to 24. Working hours at Wolfsburg may be cut too next week, Bild said. Grappling with an emissions-test cheating scandal that is costing VW billions of euros, the automaker is expected by analysts to seek price cuts from its suppliers to mitigate those costs.